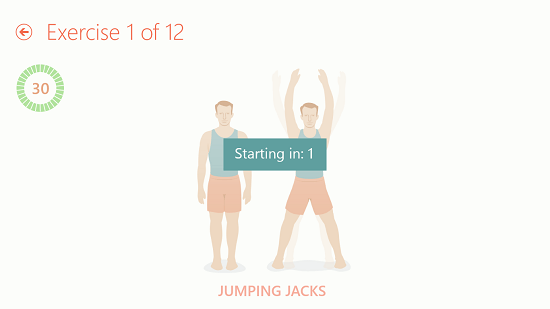 Seven – 7 Minute Workout Challenge is a free app for Windows 8 and 8.1 which allows you to get fit by taking out 7 minutes from your daily routine. The app is slightly different from other 7 minute workout apps as the app allows you to unlock various achievements as well along the way while you are using it so that you are glued to the fitness lifestyle as the achievements keep the app more interesting! The app also has various other types of workouts apart from full body workout which can either be purchased or they get unlocked automatically if you continue using the app for a month to track your workouts daily. This is another motivating factor to use the app and stay in shape. The app’s design is beautiful and neat and keeps things interesting. 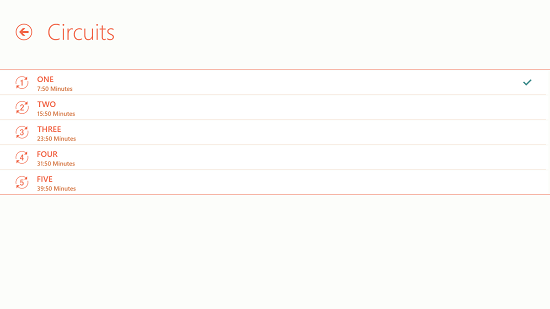 When you run the app, the main interface awaits you. You will really be blown away my the minimalism of the interface of the app. This is evident from the screenshot below. 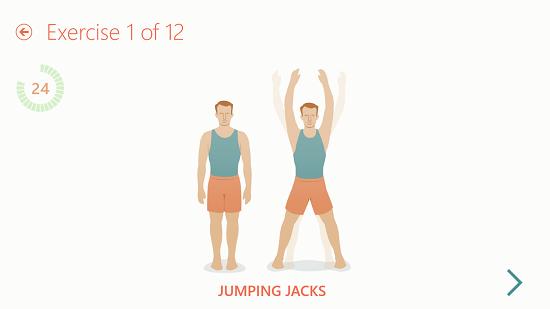 You can see the exercises present in the full body circuit by clicking on the full body icon with a man standing upright. When you do so, you will be presented with a list of exercises in the circuit. You can click on the back arrow button to return to the previous screen. Now, you can click on the Circuit button at the bottom left to change the number of circuits that you want to complete. Coming back to the main screen of the app, you can click on the Start Workout button at the left side of the screen. This button is impossible to miss as it’s the biggest button on the screen with the icon of a timer. Once pressed, it takes you over to a three second timer which when runs out, the exercises begin. Once the exercises have started, the remaining time in seconds is shown in the running timer at the top left of the screen. When the timer runs out, the exercise shifts to the next variation. 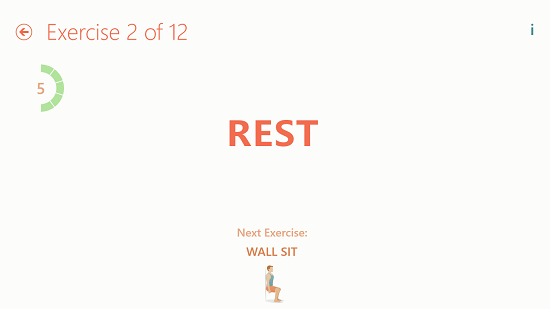 Between each two exercises, you get a 10 second rest to relax and change your position so you are in position to perform the next exercise without any hiccups. In the main screen of the app, scrolling all the way to the right will reveal the various achievements that can be unlocked if you keep using the app. These will keep you glued to the app. 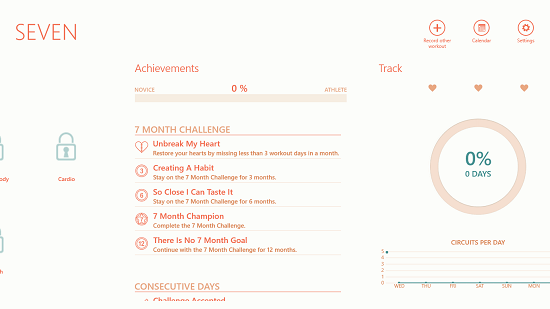 The achievement part ensures that you get your 7 minutes of workout everyday and thus are able to stay in shape! Give these fitness apps a try too! 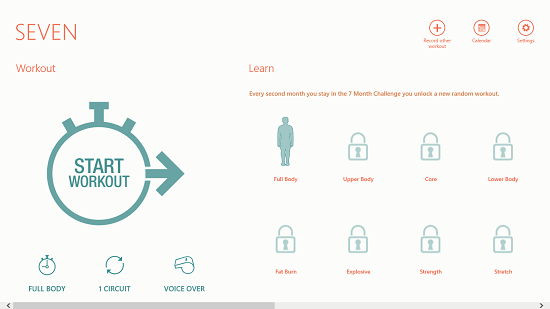 Seven – 7 Minute Workout Challenge keeps you fit and is a lightweight app which can be downloaded off the App Store for free. To get it, simply head over to the link below. 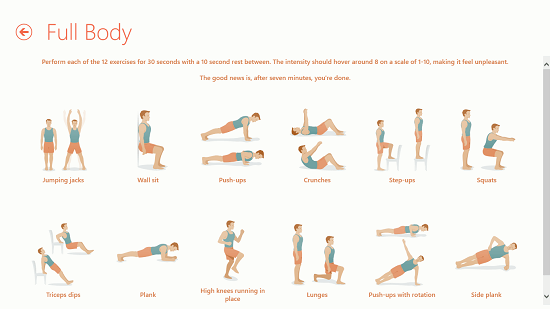 Get Seven – 7 Minute Workout Challenge.